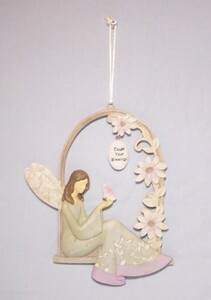 This angel is on a swing garnished with flowers and a butterfly on her hand. There is a ribbon on the top to hang it. Made of cold cast ceramic. Very pretty. 8 1/2" x 7".